Could You Handle Universal's Escape From Gringotts Ride? Could You Handle Escape From Gringotts? Just How Scary Is Universal's Harry Potter Ride? 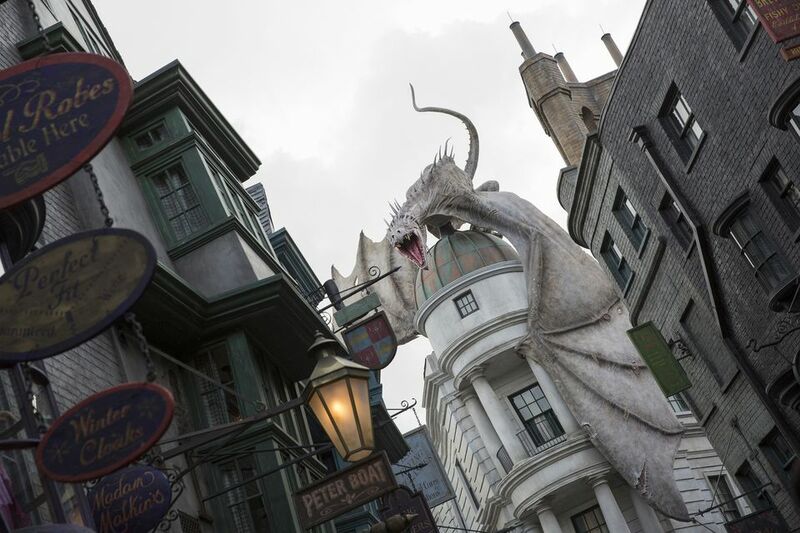 Located in The Wizarding World of Harry Potter: Diagon Alley at Universal Studios Florida, Harry Potter and the Escape From Gringotts is the centerpiece attraction. It is an astonishing achievement and immediately earned a coveted spot on the best theme park attractions list. Escape from Gringotts is a hybrid dark ride and roller coaster. “Hold on a sec,” ride wimps are probably saying. “Did you just call this a roller coaster? Would I be able to handle the thrills?” Because of the ride's popularity, this is a common question, and If you are among the, ahem, coaster challenged, your consternation is understandable. Let's try to address your concerns. Yes, the ride vehicles are on a roller coaster track, and the ride is, technically, a roller coaster. But it is fairly tame. For example, there are no inversions (in other words, it will not turn you upside down). There is one decent drop near the beginning of the ride. Official stats about its height or length are unknown (Universal remains mum on a lot if its ride specs), but estimates put it around 30 feet tall. (The big drop on Disney World's Splash Mountain, by comparison, is approximately 50 feet.) Another note about the initial drop—and be forewarned that we are moving into spoiler territory here: The stationary train slowly tilts downward, probably about 45 degrees, before releasing into a darkened tunnel for the drop. That raises the anticipation, and the pulse rates, of passengers. The fear of the unknown helps to amp up the psychological thrills. But know this: The drop is relatively short, and the train slows to a crawl at the bottom as it positions in front of the first of a series of enormous screens. There are some other high-speed sequences, but they are not excessively fast, nor do they last long. Compared to Universal's Revenge of the Mummy, which is also a hybrid coaster/dark ride, Gringotts is less challenging. It is probably about half as fast at its highest speed, and the duration of the coaster thrills are much less. It is somewhat similar to Disney's Pirates of the Caribbean in that there is a drop near the beginning (although Gringotts' drop is taller and a bit faster), and the rest of the attraction is, for the most part, a dark ride. The finale includes a high-speed (but not that high) element in which the train accelerates up an incline. Who Should Go on Escape From Gringotts? How Thrilling Is Escape From Gringotts? On a thrill scale of 0 to 10 (with 0 being wimpy and10 being yikes! ), Gringotts rates at a 4, mostly for its mild coaster thrills, but also for its dark themes, loud noises, and special effects. For comparison, Pirates of the Caribbean gets a 2, and Revenge of the Mummy scores a 6.5 on the same scale. Could you (or the wimpier members of your park posse) handle Gringotts? Only you could answer that. But if you are really freaked out, it should help you to know that the scary parts are over quickly. Plus, the ride is so well done, you'll likely find that it's worth toughing it out so that you could experience the five-star attraction. Perhaps the folks at Eternelle’s Elixir of Refreshment could whip you up a special potion to help calm your fears. By the way, for the first few years it was open, Escape From Gringotts was not included on Universal's Express program. Everybody had to wait in the standby line (although guests staying on property have always been able to get early access to the two Wizarding World lands). Now, however, guests who have Universal Express can skip the lines of both Gringotts and Harry Potter and the Forbidden Journey. If you are heading to Orlando's other major theme park resort, you might want to check out some advice about Walt Disney World for wimps. If, on the other hand, you crave thrills, make sure you don't miss out on the most thrilling rides at Universal Orlando during your visit.